The Happy Hippo is decorated in a contemporary African Ethnic theme; utilizing the vibrant colours shown through the flag and the S.A. people, and tastefully finished off with an industrial flavor. Our rooms are all different and are named so one gets to learn about this exciting nation & what it has to offer. We have a rooftop bar called the Globe, as we get to meet people from all around the world! We offer an internet café or wireless & have a curio shop which only supports local crafts & small business. Local is Lekker! (great in Afrikaans). Want to have an event that will stay in your guests memory for a long time, why not have a rooftop party under the beautiful Durban skies. We have created a unique and comfortable enviroment for anyone to come and enjoy, from birthday parties to product launches our venue can accommodate most of your needs. We can accommodate up to 400 people for a standing event (such as live music events), or 100+ people seating, but additional tables would need to be hired. We do not have catering facilities at Happy Hippo but if you are interested in food platters, we can easily organize the order for you. Or you can hire your own catering company for your event. We have several picnic tables and umbrellas available, the bar area is covered and has a small private mezzanine level. We have secure parking for up to 12 vehicles and can look at additional security for street parking. If you would like to hire decorations or additional seating, we work closely with Cheers Hiring. We could not have selected a better site for the Happy Hippo. 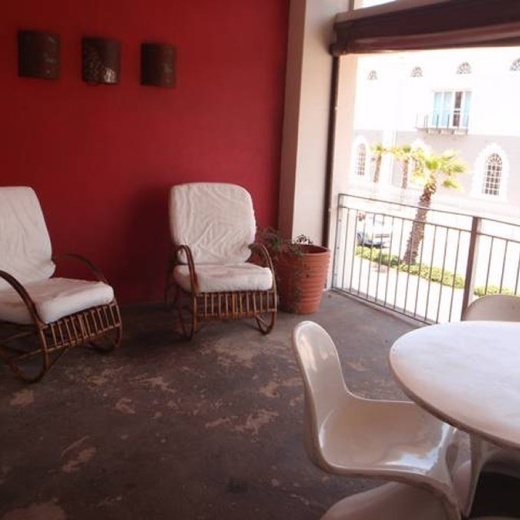 Located right on the beach front and within walking distance of the entrance to uShaka Marine World Park. Located at 222 Mahatma Gandhi Road (previously Point Road), Durban, the Happy Hippo is about as close to the action as you can get. Situated within walking distance of Durban's best beaches and on the doorstep of the uShaka Marine World, staying at the Happy Hippo means that you have easy access to many of Durban's holiday attractions without the need for transport. When you need to venture further afield or continue your exploration of South Africa, taxi, bus, train and air transport are all easily accessable. The airport shuttle bus from the new King Shaka airport picks up and drops off at our lodge. We are a Baz Bus stop as well. Please remember that the top things to do in Durban, which are very synonymous, are, trying a bunny chow, or catching a Rickshaw ride or visiting the famous Indian market. Since the 2010 World Cup held in S.A., we now have a cable car ride to the top of the Moses Mabidha Stadium, which brags beautiful views of the city & its beaches! Also, the convenience of getting off a plane at the new King Shaka International airport does door to door drop offs hourly at a fraction of the price of a taxi! Please remember that our efficient & friendly staff are always on call to help! The Happy Hippo offers a wide range of accommodation options to suit the unique requirements of the modern budget traveller and backpacker tourist visiting South Africa. Looking for a clean and comfortable bed to sleep in? Dorms, Singles, Doubles, Twins, Triples and Doubles with en-suites - the Happy Hippo Backpackers Lodge has it all. Stay for a day, week or month, its up to you.